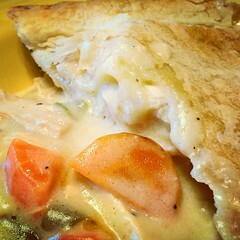 Today’s secret recipe (below) will show you how to make KFC’s chicken pot pie. Tender pieces of chicken, diced potatoes, green peas and carrots in a savory sauce. Covered with a flaky, buttery crust and baked to golden perfection. This classic dish never goes out of style. This home-style dish is a great way to make use of leftovers from a previous nights chicken dinner. I like to make a few of these and freeze them for an easy weeknight meal. In a bowl combine all cooked vegetables and chicken. Add the cream of chicken soup and seasoning. The mixture should be thick but not too thick. If the mixture is too thick, add some milk to the mixture. Scoop the mixture into individual pie pans. Use the biscuits to make the crust. Roll out the biscuit dough thin and place on top. Bake in a 375 F oven for 15 to 25 minutes or until it is heated through and the crust is golden brown.